Building your own home is an amazing adventure, but one that should probably end at some point. One of our priorities is to "finish" the area around our cottage. We'd love to have a large, stone patio, as well as a bit of lawn planted around it. While we both think mowing is pretty dumb, we have decided that being able to walk around our house without tripping over rocks or getting covered in mud is worth the tradeoff. 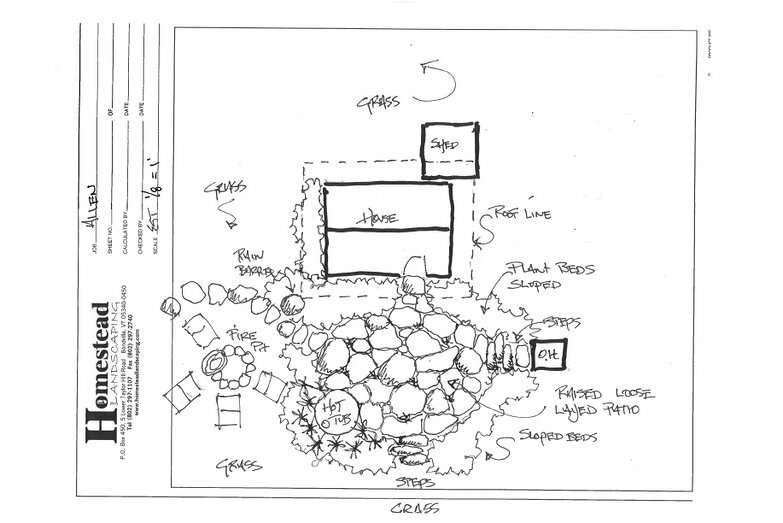 We're also planning a lavish, rambling cottage garden, and a wildflower field! Before deciding to hire out some projects, we'd been dreading our remaining plastering jobs: the finish coats on the exterior of the cottage and the interior of the studio. 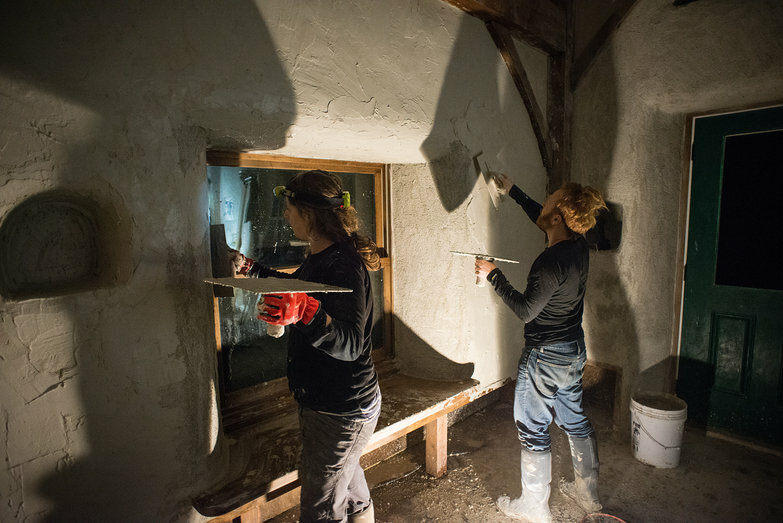 Hydraulic lime plaster dries quickly and leaves burn marks on cold joints (visible lines where an unfinished or dry section of plaster is joined with a wet one). The interior walls of our cottage were small enough for us to manage on our own, but the remaining projects aren't. So, we'd been contemplating gathering a large group of friends and teaching them how to plaster. But even if we managed to coordinate everyone's schedules, I felt doubtful we'd be able to teach the skill in such a way that a motley crew of novices would be able to do a nice-looking job of the most visually-important part of our builds. My solution was to contact Chad and Carly of Vermont Natural Homes. A few weeks ago, they visited our homestead to talk about the work ahead. It was so gratifying to chat to folks who truly understood everything we'd built. Come June, the homestead will be a flurry of plastering! 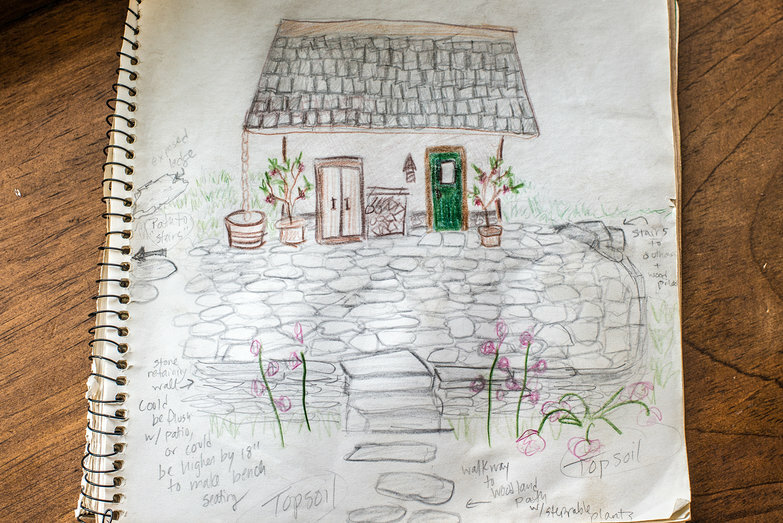 Until recently, Tyler and I still planned on installing an earthen floor in our cottage this summer. This winter, I sourced some clay for us to use, and over the past few months, we've been reading a book about constructing earthen floors together. But when Chad and Carly were here, Chad casually mentioned that doing the floor would be a very small, quick and easy project for them (not including a six-week drying time). They already had the perfect "ins" for clay (a local tennis court company), and had loads of experience installing earthen floors. They said, "You know, you could just go on an extended vacation, and when you got back, you'd have a finished floor." When they said that, our minds were blown. You mean we could we could skip town while someone else does this for us? We'd been dreading moving back into the camper for the long drying time, and now suddenly we began imagining a month in Roatan, or staying with Tyler's mom in Minnesota, or visiting Pete and Natasha, and we were sold. Whether we opt to leave or not (probably not), just knowing someone else will take care of this is a relief. I want someone who knows what they are doing to show up, take the tools out of my quivering hands, and shoo us off to bed, or to death, or to Hawaii, and to come get us when this project is miraculously over. We can totally relate to that last quote! :) You guys might know that we've built our own straw bale house near Bucharest. Aside from putting up the timber frame and the roof, we did all the work ourselves. Ours was a smaller project and is nearing completion, sort of. We just wanted to say it's been so cool and reassuring to always check in on what you two were doing at times when we thought "let's just give up" or "I can't do this anymore, let's just hire people to do it for us". Knowing there's other people out there doing similar things who are not superheroes, meant we could endure ourselves. You're our heroes anyway :) A big thank you for sharing your stories! great updates, love the sketch pad work and all the good things happening there for you guys. cheers from seattle! Cristi & Adriana - Congratulations on building your own little house! How exciting! (and totally exhausting and overwhelming, ha!) I am so glad that our project inspired you and brought solace when things were hard. Thanks for taking the time to reach out! We've never been anybody's heroes before! Great stuff Tara & Tyler! Love reading your blog. Keep up the great work! You guys are very inspirational!